Dog travel anxiety is very common, and I'm pretty sure you've seen the symptoms. Panting, shaking, whining, yawning, salivating and even unexpected urination can all be caused by anxiety and it's no fun for anyone when Fido is a drooling, quivering mess in the back seat! Plus, if your dog is prone to motion sickness, getting stressed and anxious can make him feel much worse, and increase the chances of him actually vomiting. Let's face it, dogs have to ride in the car sometimes. Even if it's just a trip to the veterinary clinic, or to the dog park. And what if you want to share your family vacation or road trip adventure with Fido, after all he's family too, right? Luckily for everyone there are lots of things that you can do to help reduce your dog's travel anxiety. Some are preventative, others can be used right before, or during, the trip itself. From natural products, through prescription medications, all the options are here. 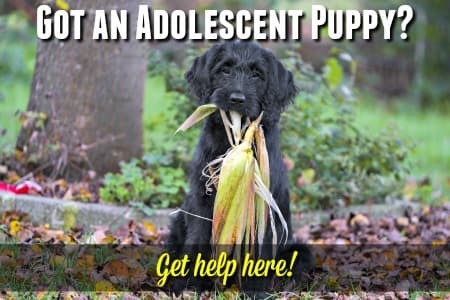 There's bound to be at least one that helps your dog. Although it's not always possible to use preventative measure to help Fido feel less stressed and anxious about traveling, there are times when a little bit of forward planning and preparation can save the day. We all know that the more times we do something (even if it makes us nervous or scared) the easier it becomes. This is because our bodies and brains acclimatize over time and with repetition we feel more comfortable and less afraid. The same principle can be used to help Fido overcome his travel anxiety, and starting with car travel is easiest because it's usually the most accessible, and under our direct control. If possible, start taking your dog on regular, short, car trips when he's a puppy, and continue the practice as he grows and matures. This exposure while he's young should enable him to build up a tolerance to the feeling and sounds of riding in a car. Which in turn should prevent him from experiencing the type of full blown anxiety an adult dog can experience if they've never ridden in a car before, or only on the annual trip to the dreaded veterinary appointment. Make as many of these trips as possible include something fun or enjoyable as part of the experience. For example, don't just load your dog up in the car when you're headed to the veterinarian or the boarding kennels. The more times Fido associates car travel with fun, the less anxious he'll be. But do keep the journeys short to begin with. As he gets more comfortable and less anxious, you can go further afield. Unfortunately the same opportunities to prevent dog travel anxiety associated with flying and air-travel isn't readily available. Unless you're a frequent flyer with a small dog or own a private plane. The good news is that depending on where you live, rail, bus or ferry travel may be easily accessible. As long as you follow the guidelines for pet travel laid down by the mode of transport (and carrier/provider) you've chosen, taking your dog on frequent trips in the same way as described for car travel will work equally well to de-sensitize him to the noise and motion, and reduce or prevent anxiety. No matter which mode of transport you're using, if you want your dog to be your traveling companion, start early.. and realize that even once he's comfortable in a car, that doesn't mean he'll automatically feel comfortable on a train, or an airplane... the experiences are totally different. So practice taking trips in any, and all, moving vehicles whenever you can. Giving your dog a little exercise an hour or two before you're due to start out on your trip may help keep him calmer because he'll be somewhat tired. It needs to be a quiet, calm type of walk, not a vigorous game of fetch or an excited play session at the dog park. You want him to be pleasantly tired and relaxed. Not wound up and over-stimulated as this will make his travel anxiety symptoms worse. Anxiety can often be reduced using gentle, effective and time-proven natural remedies and products. The same remedies for dogs with travel anxiety are also effective for separation anxiety and other stressful situations such as the fear of fireworks or thunderstorms. Pheromone products for dog anxiety mimic the natural scent produced by nursing mother dogs which calms puppies, and works equally well on older dogs. Totally natural and undetectable to the human nose, these work very well for all types of anxiety in dogs. A collar infused with these pheromones works well. It's not an instant-fix, you'll see improvement within 24 - 48 hours so put that collar on Fido in plenty of time. Take along a pheromone spray to use as a back-up on the journey, or to help relax your dog once you reach your destination. A pheromone room diffuser is also great for at-home use, to treat separation anxiety, generalize anxiety, or as an added 'boost' to calm your dog before a journey. ThunderEase anti-anxiety pheromone diffuser and/or a ThunderEase pheromone collar both from the makers of the famous Thundershirt. The most popular and well-known of these is Bach Rescue Remedy for Pets, which is a quick-fix for reducing Fido's anxiety. This homeopathic product is a natural blend of five flower essences in an alcohol free base is specifically designed to relieve anxiety in pets, and has been proven effective for decades. It's widely recommended for safe, gentle relief of stress and anxiety, whether it's due to travel, separation, situational fears, environmental changes and more. You can add the liquid drops to Fidos water, allow it to be absorbed into a favorite treat, or simply squeeze them into your dog's mouth. This natural herbal liquid is formulated entirely from certified organic and ethically wild-harvested herbs. The ingredients have a gently sedative effect and reduce anxiety and promote calm quickly, safely and effectively. Won't cause any upset tummy or unwanted side effects. Stress Gold for Dogs can safely be used for all types of anxiety and in many different situations. Zylkene uses the calming properties of bovine-sourced hydrolyzed milk protein as the active ingredient in this natural remedy for dog anxiety. Available in daily capsule form which can be given whole, or you can open them up and sprinkle the powder on your dogs food, or put it in a pill pocket, peanut butter etc. This treatment works best when it has a cumulative effect and isn't a quick-fix. For maximum effectiveness start giving Zylkene to your dog a week before the expected trip begins. If this isn't possible, or you're 'late to the party', administer it for a minimum of 24 - 48 hours ahead of time. Melatonin is a natural hormone which is manufactured by the Pineal gland in the brain. One function of melatonin is to regulate and improve sleep cycles, but it also has a generalized calming effect which makes it a natural and safe option for reducing dog anxiety... whether it's dog travel anxiety, separation anxiety or a situational/environmental fear. But, don't expect melatonin to make your dog drowsy or sleepy the way something like Alprazolam will. You may notice any outward effects at all, except that in a stressful situation your dog is less anxious. Dog-safe melatonin comes in formulas specifically designed for pet use, and much safer and more appropriate than the formulas meant for people. Melatonin affects each of us differently, and there's no 'one-size-fits-all' dosage. I may find 1mg helps me sleep peacefully, someone else may need 5mg, 10mg or whatever. It works the same way for dogs. Any dog weighing less than 10lbs shouldn't take more than 1mg of Melatonin. Mid-sized dogs (up to 50lbs in weight) can take between 1 and 3 mg and XL or giant dogs between 3 and 9 mg.. but that's a BIG dose and unlikely to be necessary, or advisable. If you use 1mg per 20lbs as a rough guide you should be in the ball park. But be sure to check with your veterinarian before giving Fido melatonin (or any other supplement and/or medication) just to make sure he's a good candidate for it. Because of the possibility that melatonin can affect the body's hormones, it's not recommended for pregnant or nursing dogs or for young puppies. To keep your dog safe when using melatonin for his dog travel anxiety, check out K9 Choice 3mg Chewable Melatonin Tablets for Dogs (available in several different flavors), or Healthy Pets 2mg Mela-Vet Melatonin Soft Chews. In the human world the interest in using Hemp Oil/CBD Oil for treating a whole range of conditions including pain, anxiety, cancer, OCD and much more, is climbing steadily. Many people, and doctors, are seeing significant improvement and healing across the board. Hemp Oil can do the same for Fido, and reducing his anxiety is definitely a part of it's abilities. If you're not too familiar with this concept, Hemp Oil is made from the Hemp plant, and contains high levels of cannabinoids (NON psycho-active chemical compounds) which have potent healing properties and are packed full of Omega-3 and Omega-6 fatty acids, proteins and anti-oxidants. Hemp Oil contains negligible levels of THC (Tetrahydrocannabinol) which are the psycho active chemicals. This is NOT marijuana, medical or otherwise. Your dog will NOT get high from Hemp Oil, not at all! He could, however, feel a lot less anxious. You can use Hemp Oil which has been specifically formulated for dogs to reduce dog travel anxiety, OCD behavior, aggression, separation anxiety and more. Canna-Pet have created an organic, whole-plant product range. The first of it's kind. Product line is also vegan, cruelty-free, non GMO and preservative free. Canna-Pet products are veterinarian recommended, covered by major pet health insurers and have a 30 day, fully money-back guarantee. The vegetarian capsules can be slipped into a pill-pocket or treat, or open a capsule and sprinkle the powder on your dogs' food. For all variations, how many capsules you give, and how often, depends on the age/weight of your dog and full instructions are on the bottles. There are several other hemp oil products on the market to choose from. A Thundershirt uses gentle, but constant, pressure to help your dog feel calmer, similar to the way in which swaddling a baby calms him/her down. So simple. Recommended by veterinarians and with millions of satisfied users, the Thundershirt Anti-Anxiety Dog Jacket is simple to put on and is effective in reducing anxiety levels in many dogs, in a variety of situations. But if your dog is one of the small percentage of dogs who isn't comforted, ThunderShirt offers a money-back guarantee. Peace of mind for you both. Lavender is an age-old treatment for reducing tension and anxiety, and promoting a feeling of calm. Given how much stronger a dog's sense of smell is than a humans, it's really no surprise that lavender is just as effective at relieving Fido's anxiety as it is ours. Always use a high quality, pure essential oil for diffusers or when appling a few drops to your dogs collar. In a study of dogs with a history of travel-related anxiety and hyperacitivity at the Canine Behavior Center in Belfast, Northern Ireland, researchers found that being exposed to the scent of lavender during car rides had a noticeable effect. The dogs who inhaled the scent of lavender while traveling spent significantly more time sitting and resting, as opposed to being restless and vocal. Although medicating your dog for travel anxiety should never be your first choice, it is an option if all else fails and you have take a sudden, or extended, trip before he's comfortable with traveling. The down side of using prescription medications for your dog's anxiety is that they all have unwanted side effects. Some more disruptive, or even dangerous, than others. Your vet may choose to prescribe a sedative such as Alprazolam, an antihistamine, or an Anxyiolitic such as Fluoxetine. Alprazolam is what many veterinarians choose for dogs with travel triggered anxiety and I've given you a closer look at this drug below. There are many other drugs, and classes of drugs, available such as Amitriptyline, Diazepam, Clomicalm and Fluoxetine (to name a few). Only your veterinarian, with his/her knowledge of your dog's health history and temperament can make a suggestion or recommendation. I'm purposely not going to look closely at the number and variety of options because I strongly recommend talking to your vet about this so that you can find the best (and safest) fit for Fido. Alprazolam is a drug from the Benzodiazepine group which has a sedative and muscle-relaxing effect, calming your dog and often making him sleepy. Although it isn't FDA-approved for pets, it's totally legal for your veterinarian to prescribe Alprazolam for your dog's anxiety because there is no dog-specific alternative. This medication works best if you give Fido a dose before he gets too anxious, and it can be given every 12 hours. Recommeded dosage of Alprazolam for dogs is 1mg per kg of body weight, given every 12 hours... but even if your dog's weight indicates it, never give more than 4 mg in a 24 hour period! If you take Alprazolam yourself (I do, for air travel anxiety!) please don't be tempted to share your pills with Fido. It's vital to have your vet examine him first, check his health history and prescribe the right medication and dosage specifically for YOUR dog. Unless your veterinarian specifically prescribes it, Alprazolam isn't recommended for dogs with liver disease, kidney disease or glaucoma. It's also not suitable for dogs who are pregnant, or elderly. Benadryl is a name we're all familiar with, and you probably know that if you take this for your allergies it will make you sleepy! The sedative effect of Benadryl (active ingredient Diphenhydramine) is one of the reasons your vet may suggest that you give Fido some to help reduce his dog travel anxiety issues. As an added bonus, Benadryl can help reduce nausea too. So if your dog is anxious and motion sick, this could help on both fronts. The recommended dosage of Benadryl (tablet form) for dogs is 1/2mg per pound of body weight, and it can be given every eight hours if necessary. Choose the tablets whenever possible as the adult liquid form of Benadryl contains alcohol, not something you want your dog to take. 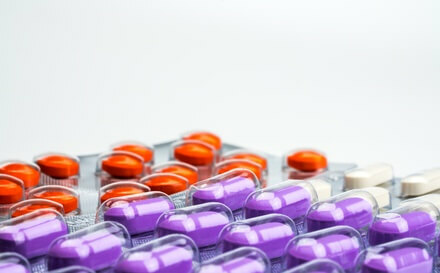 The recommended dosage of Adult Benadryl for dogs is 0.4 ml per pound of bodyweight. Children's Benadryl doesn't contain alcohol so you can use that. Recommended dosage of Children's Benadryl for dogs is 1 ml per 2.5lbs of bodyweight. You need an accurate syringe to measure such tiny dosages, especially if you have a small breed dog. You can get these from your veterinary clinic or a local pharmacy. Our dogs can get anxious for all sorts of reasons other than travel. These include dog separation anxiety, having a fear of loud noises such as fireworks or thunder and more. Motion sickness in dogs can be caused by travel anxiety, or vice versa, and approximately 20% of dogs suffer from this uncomfortable and distressing condition. Fido doesn't need to be anxious to feel nauseous but a dog who's feeling sick is most likely going to feel stressed and upset. 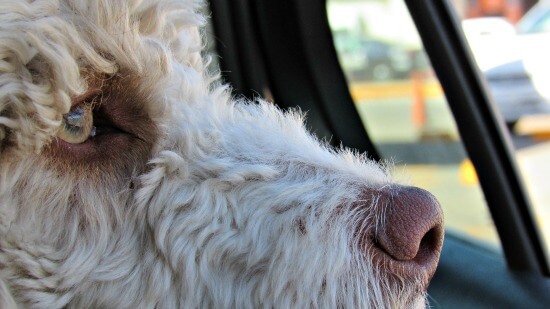 Like people, some dogs seem to be more prone to motion sickness than others. Also like us, they can often outgrow the problem, or symptoms improve with regular outings. Because travel sickness is often caused by a loss of equilibrium (balance) due to the motion of a vehicle, minimizing these effects can help. Puppies often have more trouble with nausea because their inner ear mechanisms aren't as well developed and fine-tuned as those of an adult dog. As a pup matures the nausea generally disappears. It may not be possible to prevent your dog from vomiting every time, but there are some things that you can do which could make him feel better. 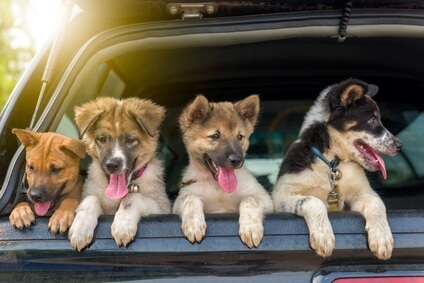 As discussed in the section above on behavioral modification for dog travel anxiety, desensitizing your dog by taking frequent, short car trips can also reduce his tendency to motion sickness over time. In addition to the basic tips above, there are natural remedies for nausea that may help your dog. These can be very effective and don't have the side-effects that medications often cause. There are a few different products or medications you can give to your dog to help him feel less nauseous, and possibly eliminate it entirely. Some of them will most likely make him drowsy, in the same way that the anti-anxiety remedies will. Benadryl is a popular, and easy to find option, but never give anything to your dog without checking with your veterinarian first. Find out all about giving Benadryl to your dog in the section on travel anxiety remedies above. It works well for both anxiety and nausea. Hemp Oil is a natural product which can reduce both anxiety and nausea, and is proving to be effective in treating a wide range of physical and emotional issues (both in humans and dogs). Check out the Hemp Oil information and product links in the section on natural remedies for dog travel anxiety above. Dimenhydrinate is an antihistamine which is often prescribed to relieve nausea. It's the active ingredient in familiar names such as Dramamine and Gravol. If you've ever taken either of these, chances are it made you feel sleepy. This is also likely to happen to your dog. Although not specifically registered for use in dogs, veterinarians routinely recommend both of these products for dogs with nausea, not just motion sickness. Dosage for dogs is recommended at between 1.5 mg to 3.5 mg per lb of body weight, given every 8 hours maximum. Dramamine and Gravol work best if you give your dog his dose around 30 minutes before you get in the car, on the plane etc. Your veterinarian may approve a higher dosage, up to a maximum of 50 mg per dose, but don't do this yourself, always consult a vet first. Adult formula Dramamine comes in 50mg scored tablets, which makes it fairly easy to give the correct dosage for medium to large sized dogs (always go under, rather than over if you can't get an exact measurement). Dramamine for Kids comes in 25 mg tablets, so that may be easier for smaller dogs. Gravol for Adults also comes in 50 mg tablets, while Gravol Kids is available as 15 mg tablets or a Gravol for Kids Liquid which contains 15 mg per 5 ml (I teaspoon=5ml). Although Dimenhydrinate is generally safe for use in dogs, ALWAYS check with your own veterinarian before giving Fido any medication or supplement. 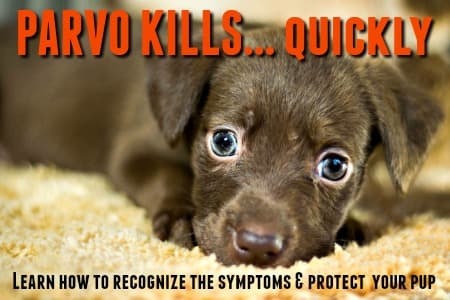 Don't give your dog Gravol or Dramamine IF he has heart disease, thyroid disease, high blood pressure, glaucoma, stomach or urinary system problems. Cerenia is a neurokinin receptor blocker and is the first-of-its kind FDA approved veterinary medication specifically formulated to reduce nausea and vomiting in dogs. It's very effective at reducing, even eliminating, motion sickness due to travel. Cerenia is designed to be given once per day (for a maximum of two days), and works best if given around two hours before you set off. Because food in his stomach may slow down the absorption (and reduce the effectiveness) of Cerenia it's best given on an empty stomach. Available by prescription only. Bear in mind that Cerenia doesn't have the same sedative type effects that an antihistamine might, so it won't have any effect on your dog travel anxiety.. it's purely for nausea and/or vomiting. Recommended dosage for dog motion sickness is 8mg per kg (1kg=2.2lbs) of body weight. Cerenia is available as 16 mg, 24 mg, 60mg and 160 mg tablets. And dosage is ONCE per 24 hours. Choose the size which is going to make it easiest to measure out the correct dosage for your dog.